I agree with the Chronicle: the Ashby ruling is a disaster. If every neighborhood that is slightly nuisanced by a development has grounding to sue, then development predictability goes out the window and we end up with chaos, gridlock, and rising unaffordability as supply gets further constrained. This has to be overturned on appeal. Development is regulated by the City - once permits are in place, a developer has to know they have the right to proceed. People need to clearly understand: if safe predictable conformity is important to you, then make sure you buy in a deed restricted community. If you choose not to, then you take your risk. You have no right to buy next to unrestricted land and then complain when the owner does what he has every right to do with that land. The Wall Street Journal on how to identify the next hot neighborhood. I'm very interested in reader opinions in the comments on where they think this is happening in Houston. 10-15 years ago you might have said Montrose, Midtown, and Rice Military/Washington Ave. Now, obviously around the Heights and Garden Oaks, but maybe even further east near the new North rail line? EaDo and the East End? Downtown itself? Thoughts? "Procell points out that while there are many small strip shops along the Red Line, Northline Commons will be the only major retail center on any of the rail lines (current or coming). He said he foresees a day when a downtown worker will use the rail line to pick up supplies at Office Depot or do some lunchtime shopping at Walmart. The ride from the UH-Downtown stop to Northline Commons takes about 19 minutes." Wait, he thinks downtown office workers will spend a half-hour each way (once you include walking, waiting, and using stops south of UHD) to go shopping during their lunch *hour*? Sorry, the math doesn't quite work. Sounds cool in theory, but I think few will find it practical in reality because the line is simply too slow. "Urbanists put way too little thought into business climate, which can sound like such a shady way of saying cut services and taxes. But taxes are often the least part of it. It’s the regulatory apparatus that makes doing business in many places too painful to contemplate. This even affects city-suburb investment patterns. I’ve observed that in many places, the urban core is a flat out terrible place to do business, unless you’re very politically wired up. This doesn’t usually bother urbanists all that much until a trendy business they like gets affected. For example, an urban farming supply shop in Providence called Cluck got sued when they tried to open. The beautiful and the bearded were outraged and the shop was ultimately approved. But there’s no similar visibility or outrage when a Latino immigrant runs into the red-tape buzzsaw when he tries to open a muffler shop. If we want to promote investments in our cities and states, we need to be focused on basics like an objective, predictable regulatory framework that operates in the timely fashion and in which arbitrary denials, rule changes, and such are minimized. 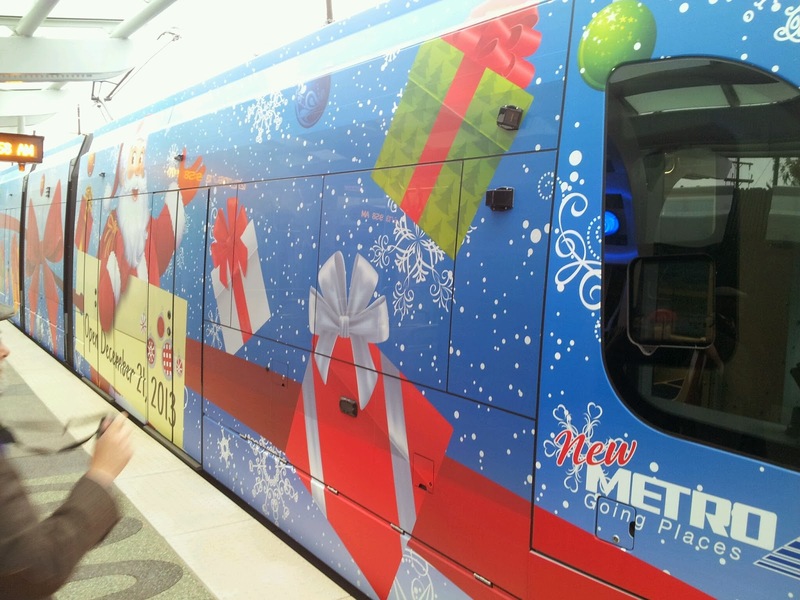 This is way more important to attracting capital investment than sexier items like streetcar lines." This cracked me up. It's a NYT quiz to determine your geography by your dialect and the words you use. Question 20 asks about what to call service roads next to freeways. I picked "feeder" and got a national map back covered in dark blue (i.e. nobody uses that word) except for a big red blob right over Houston! Yep, that's our own local lingo. My own blended heat map was definitely Houston-centric, so it was right on target for me. 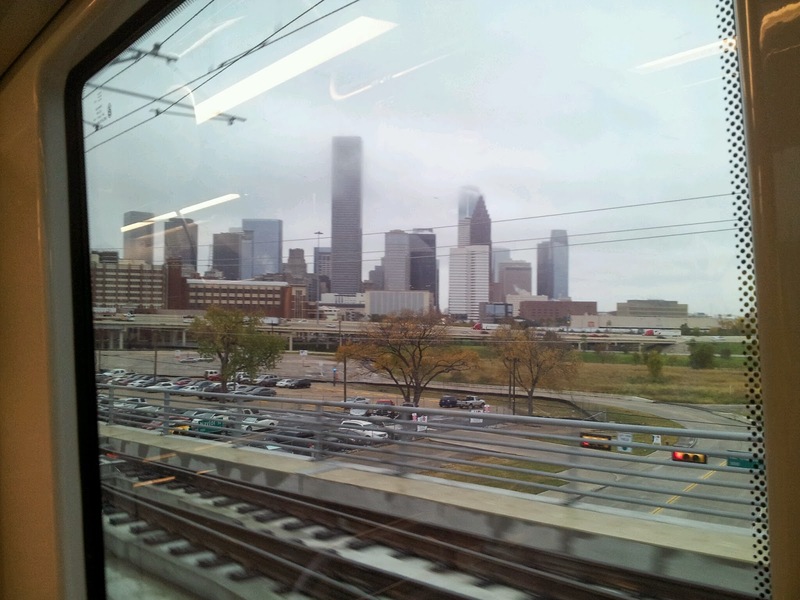 Finally, one of the complaints about Houston is that we don't have distinctive seasons like up north. Is it just me, or is anybody else noticing some impressive fall foliage this season in Houston with some really vibrant reds, oranges, and yellows? I'm guessing it's the early sharp cold front, but there seem to be a lot of really beautiful trees right now around Houston - something I don't remember noticing as vividly in previous years. My mom says it's the most beautiful fall she can remember. They won't last long. Hope you're enjoying them while you can and have a very happy holidays. Great Cite story on the history, architecture, and future of Rice Stadium. Hat tip to Walker. Chicago vs. Houston in 4 charts. Zing! Hat tip to Chris. 2014 GHP employment forecast, where they expect us to moderate to more sustainable growth. I do think it would be good to have moderate growth for a while and let home builders catch up before we lose our affordability from demand temporarily outpacing supply. Lots of good data, analysis and insights in here. KUHF story here. A pretty cool scale model of downtown Houston. 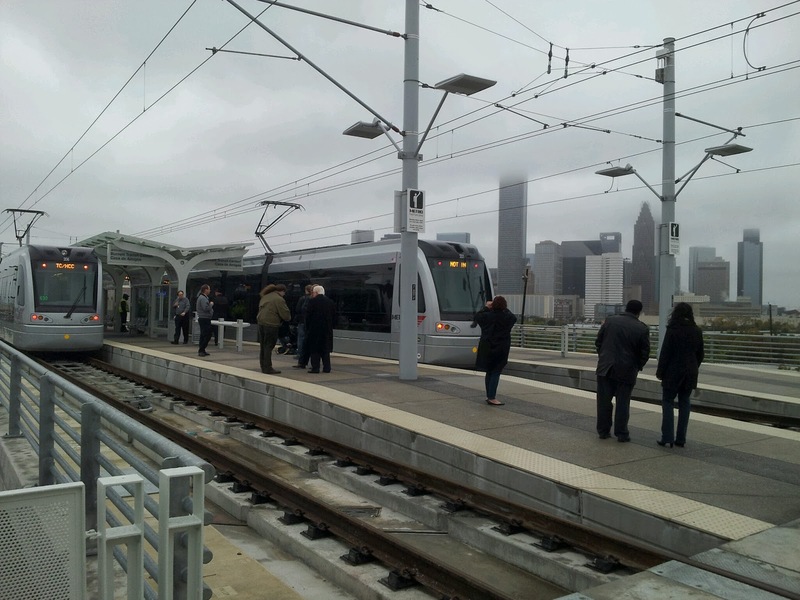 "What conclusions can we draw from economists’ view of rail transit? Economists demonstrate a range of views regardless of the particular justification examined. Still some justifications receive more support than others. 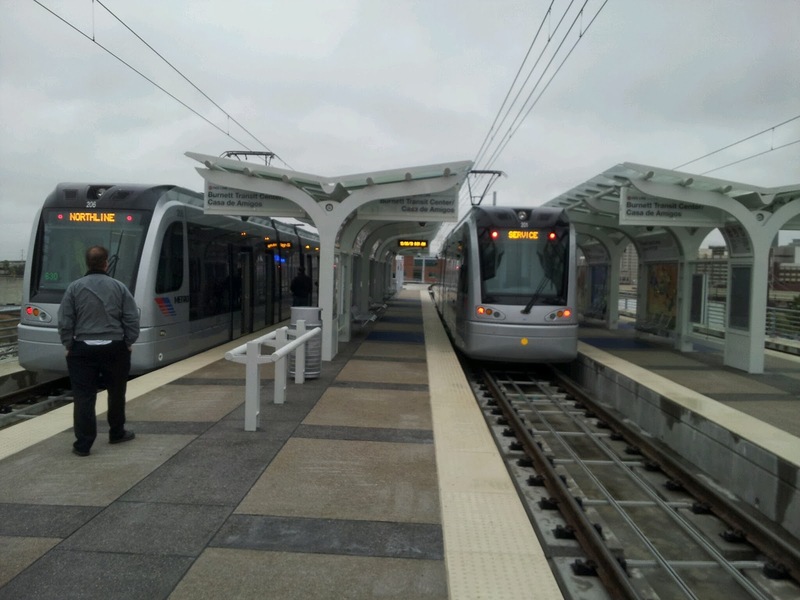 Although the matter is filled with disagreement and caveats, economists appear to be the most optimistic about rail transit’s impact on economic development, especially its impact on residential housing values. Economists seem to be less optimistic about rail’s ability to achieve environmental improvement and serve the transit dependent poor. Economists seem quite pessimistic about rail’s ability to achieve key transportation-related goals, like reducing congestion, and they tend to see other modes, primarily bus, as more functional and worthwhile. Economists often attribute rail’s political success to their belief that decision-makers are motivated by rent-seeking and romantic factors. 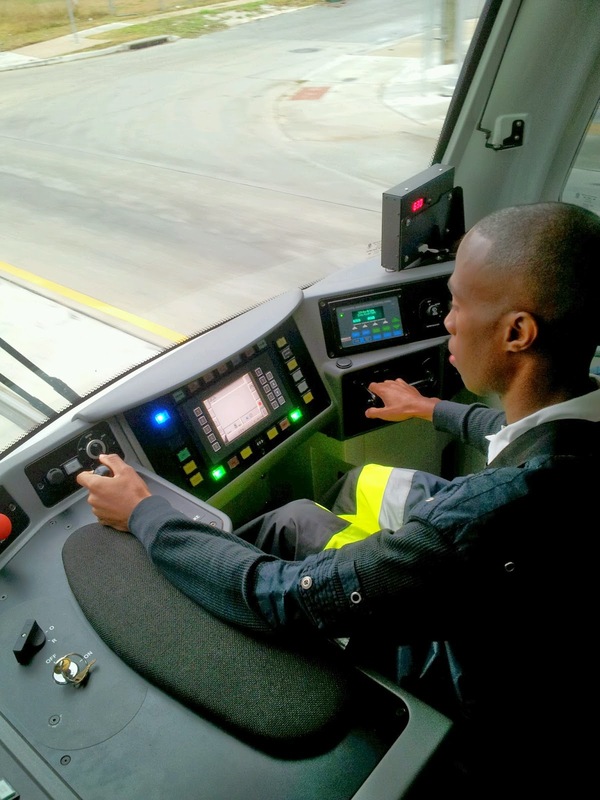 Of those economists who offer a big-picture view, there appears to be wide, though not unanimous, agreement that rail’s costs exceed its benefits. And it seems that almost all economists who write about rail agree that various demographic features, such as suburbanization, the declining influence of central business districts, and increasing wealth will make it increasingly difficult to design successful rail systems." 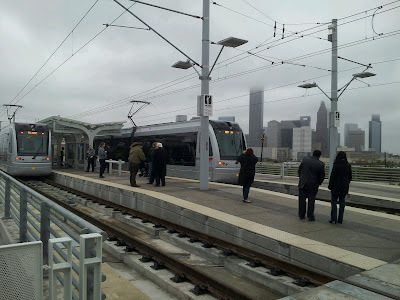 "Transportation engineers are loath to support new streetcar lines because they cannot understand why it makes sense to spend hundreds of millions of dollars in a rail line when a far cheaper bus service would provide similar, or even more, mobility benefits. From the pure perspective of moving people from one place to another, streetcars are irrational investments. Some Portland residents have expressed concerns that the streetcar has been excessively subsidized even as bus routes have faced service cuts and increasing fares because of declining revenue." On a final note, after speaking with Mayor Parker last week at her holiday party, I do have very high hopes for her final term to finally address some critical long-term issues for Houston, including pensions sustainability and the Ike Dike. These would be signature legacy accomplishments if achieved. If you're in a position to support her on these issues (as well as others) in some way, I sincerely hope you do so (and yes, I'm talking to you, county, state, and federal legislators). It's time to stop kicking the can down the road making these issues the next mayor's problem. New maps are on the trains. The left side red section is opening this month. 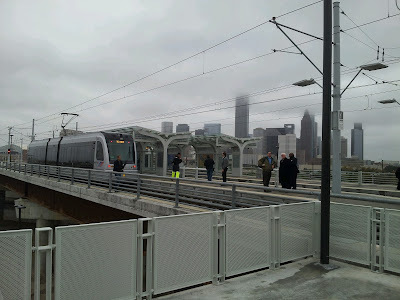 The Burnett St. Station and Transit Center has an impressive elevated platform view of downtown. The bus transit center is under construction. Skyline view pulling into Burnett station. 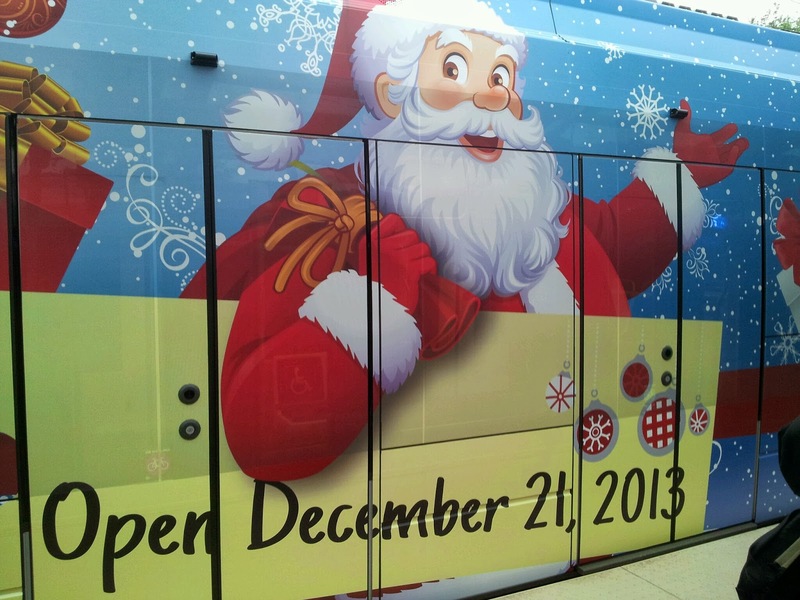 The Christmas train announces the opening date. Get it? It's a Christmas gift from METRO to the city. You will now be able to reach a Wal-Mart Supercenter by rail, which includes groceries. Actually, Northline Commons has a lot of retail, and an HCC campus. And Midtown has the Randall's grocery store just a couple blocks off the line. It now actually might be possible to manage most everyday shopping trips off of the rail line if one were so inclined. The stations are very well done with nice artwork. Signs of new development are thin: I counted one new townhome development, another small apartment complex, and a nice strip center or two. The train buzzed with speculation of how fast any new investment and redevelopment would occur. It's a big open question at this point. My guess is very slowly, especially looking at the rail-served parts of Midtown 10 years after the line opened. Sure, there are signs of good stuff happening (like MidMain), but they've been very slow to develop. And, frankly, the north side doesn't have the same location advantages as Midtown. 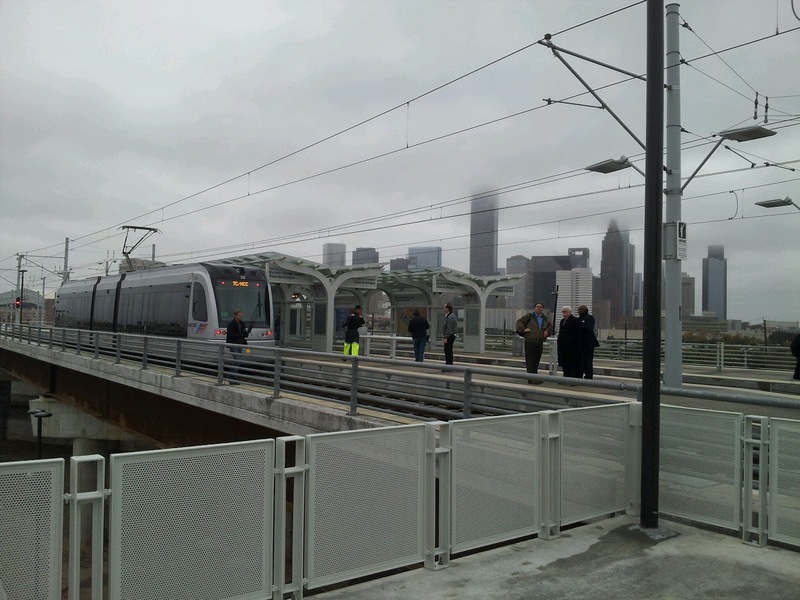 The current estimate is that the train will take about 20 mins from UHD to the Northline end covering 5.3 miles. Add that to the current Main St. line, and you have ~50 mins end-to-end for about 12 miles. That's about 14mph net speed - not exactly flying. Somebody living up there could easily be looking at a 30-40 min commute to the medical center - surprisingly long given the short distance. To put that in context, in non-rush-hour traffic it takes me about 45 mins to get from Midtown to Tomball! But it honestly might be somewhat competitive with driving at rush hour, especially when you consider the cost and hassle of med center traffic and parking. That last point reinforces something I've been saying for a while: people may still face some daunting travel times to their final destination even after they've been connected into the rail network. I occasionally hear people sort of hand wave that once somebody has transferred to the rails they're magically at their destination, whether that's downtown, TMC, UH, or, one day, Greenway or Uptown. That is far from the case. I think once you add up the travel times, very few people will want to take an HOV bus downtown and then transfer to UH, TMC, or elsewhere. METRO still needs to work on more direct express lane service to alternate job centers like TMC and Uptown. Rail network connections are not a magic silver bullet for that. 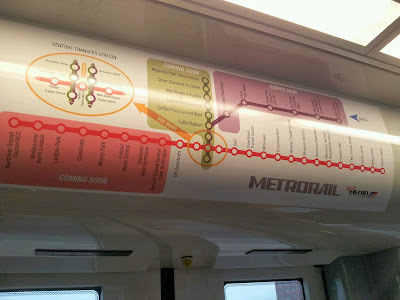 Overall, METRO seems to have done a solid job on the new line. 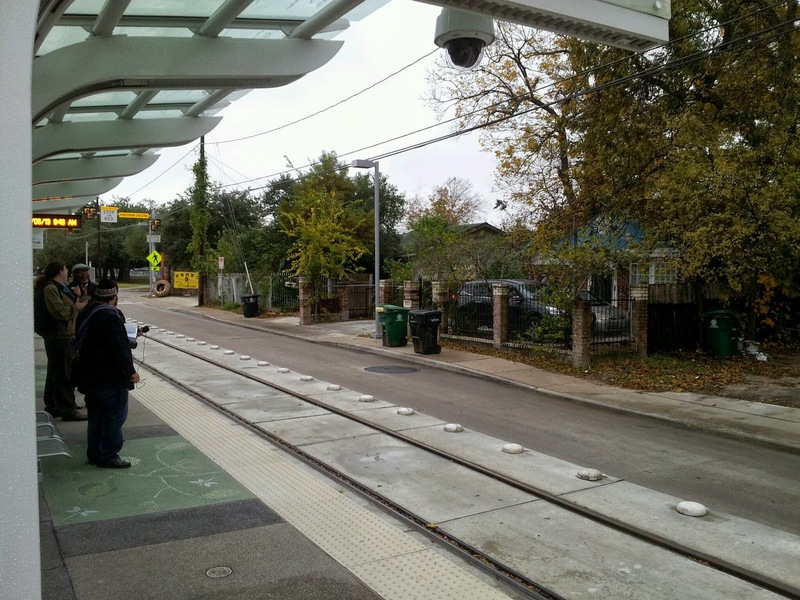 Only time will tell what ridership develops and how the neighborhood transforms. Hope you had a great Thanksgiving weekend. Just a few quick items this week. "Essentially the city relies on the market to dictate development patterns, and these patterns are sometimes at odds with what conventional planning might dictate. Even so, advocates, developers and city leaders who don’t always see eye to eye generally believe the arrangement has worked in Houston’s favor over the years, allowing developers to respond quickly to market conditions and keep housing costs low. Regardless of individual Houstonians’ views on zoning, that part of the system is probably not changing. Four attempts at altering it have all failed." "This picture has changed over the past decade. California’s tech manufacturing sector has shrunk, and those employed in Silicon Valley are increasingly well-compensated programmers, engineers and marketers. There has been little growth in good-paying blue collar or even middle management jobs. Since 2001 state production of “middle skill” jobs—those that generally require two years of training after high-school—have grown roughly half as quickly as the national average and one-tenth as fast as similar jobs in arch-rival Texas." WSJ.com - Randal O'Toole. Honk if You Love the Mass-Produced Automobile. Cars will soon emit less pollution than public transit. Finally, another reason to be thankful you live in Houston! Hat tip to Jim.